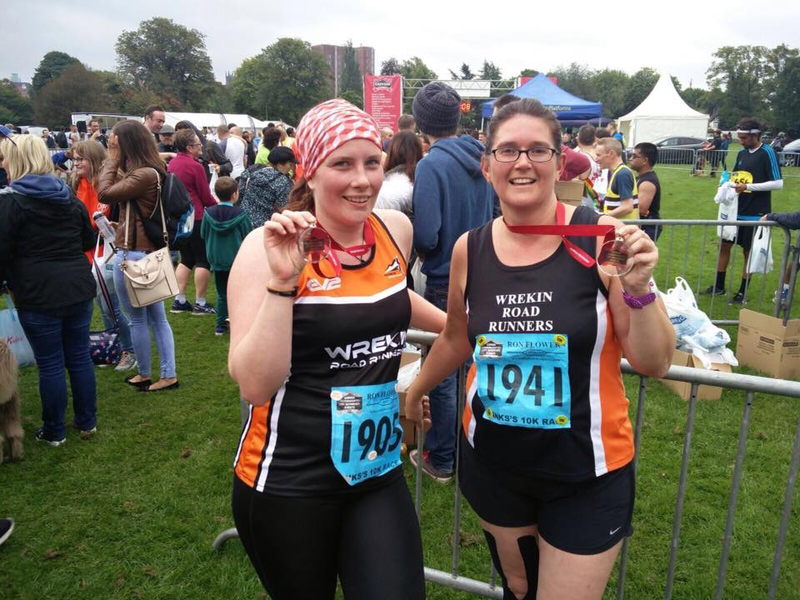 On September 30th Janet & I did the Senses 5k in the town park, very interesting little run with different type of senses including counting guide dogs, bubbles that smell of mint, candy floss and finally running through lots of foam, great fun! Then janet and I popped over to Aldridge Airport to do the Poppy 10k run this is not a easy run as the grass was quite long up hill everything very wet but we plodded on through the woods uneven ground well mark plenty of Marshalls. I was well looked after by a nice young man, janet was in front of me when I got to 9k I turn left and janet went missing so after a while I had to send my toy boy to find Janet so in the end I finish in front of her nice medal free home cake and tea, after we fell in to a pub and had great fun with the Birchfield Harriers gang. Things didn’t get off to a great start when Elaine and Rob couldn’t find the race registration and Manda and I both somehow ended up at the wrong railway station! Porthmadog is tiny town and it still manages to have two Heritage Railway stations…. This pretty much sums up my only complaint about this event, which was the laid back instructions about timings, location, bag drop facilities, the distance between feeding stations and generally everything else! The website appeared to provide all the relevant information but it didn’t always match the reality – don’t get me started on the confusion Elaine and I encountered just trying to sort out our respective spectator rail tickets. Despite this, everyone I spoke to on the day was really helpful and the atmosphere was very friendly. We all eventually found the registration where we were given race numbers, a technical t-shirt (which actually fit for a change), a bottle of locally brewed beer and very helpfully a bottle opener! We then got on the train which would transport us to the start of the race where we were joined by Sally, Donna and Kelly. 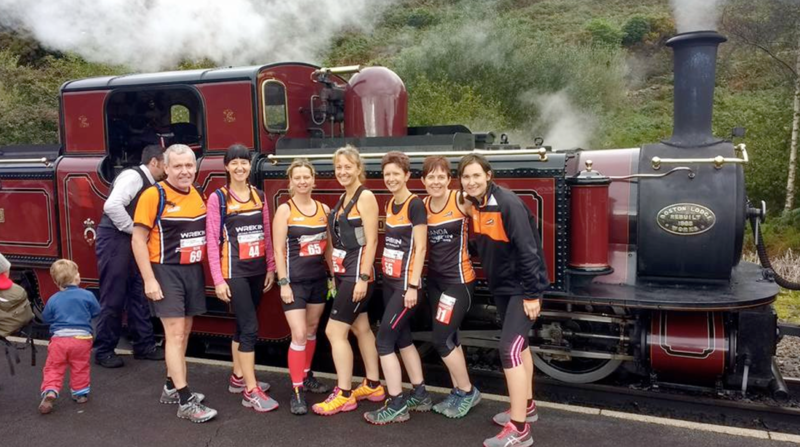 The journey took just over an hour through some stunning Welsh countryside before we got off the train at the start line (again a bit confusing as the train continued on to Ffestiniog but we followed Sally and Donna who had done the race the previous year). The race briefing covered the fact that the course was really wet and muddy and was actually over 13½ miles – oh joy! The start of the race was then sounded by the train whistle (pretty cool!) and we were off. It didn’t take long before it became all too apparent that the warning of wet conditions had not been exaggerated. After a series of puddle dodges and a few girly squeals (I’m pretty sure Kelly was the culprit!) we all gave up trying to keep our feet dry and just waded on through. This was just the start however, and it wasn’t long before the mud took hold. The mud on the tracks was thick and made conditions really slippery but it was the “mud” in the fields which was more concerning. I tried not to think about what I was actually running through as it seeped over the top of my trainers and into my socks…. Whatever it was I have it on good authority that it was potent enough to strip nail polish! The route was very clearly marked with arrows at regular intervals and on every junction. The marshals and support team were all really friendly and supportive, although I’m not quite sure what one of them meant when he suggested “less chat ladies” as we passed by…… The feeding stations were well stocked with water, isotonic drinks, jelly babies, flapjacks, custard creams, bourbons and chocolate brownies – it was tempting just to hang around and feed my face. Unfortunately I’ve still not mastered eating while running so after hanging around for a short while for a chat and catch-up with our fellow WRRs I had to leave all the food behind and struggle on with just a single jelly baby (which still made me belch lots…sorry Elaine). The train followed the race back to Porthmadog but we were a bit too far behind the leaders for us to see it or for our supporters to see us – we could hear the whistle taunting us but it was too far in front for us to catch. At one point we could hear the train and saw smoke heading towards us. We got all excited and waited on the hill to wave at our support crew – as the train rounded the corner we waved like a bunch of lunatics. Embarrassingly it dawned on us that the train was full of people which meant it was a regular train rather than our event one – I’m sure the passengers appreciated the sight of a bunch of Wrekin Road Runners jumping up and down and waving at them. The route was really varied taking us along tracks, across fields, through woodland, and past some really beautiful scenery. It was really challenging but great fun. The worst bit was the final 1½ miles which followed the road and then joined the railway line back to the station. It was long and straight and it was really tough as you could see the finish but it seemed to take forever to close the distance.... The view of the sea to the left and the mountains to the right was pretty impressive though, and it was a bit surreal when a steam train came heading down the track towards me and passed by with what felt like only inches to spare! My tired legs finally carried me across the finish line where we were given an event mug rather than a medal – it proved to be an environmentally friendly way of providing the post-race water though as everyone took their empty cup away with them rather than littering the station with plastic cups/bottles. Located directly behind the finish line was the Station Inn where we found our support crew sampling the range of local ales on offer. It would have been rude not to join them! The event was concluded with a race number raffle with Donna and Kelly both winning prizes. I loved this race and it currently ranks as one of my all time favourites – even the fact that I was beaten by the oldest competitor in the race (a lovely lady in her 70s) didn’t put me off! Would I do it again? Most definitely. Beers, Tents, Licked Sweets, lost nappies, Gin Buckets, Jager Bombs, Lemon Sherbets and some 250k + of running between 8 people. Firstly a bit of background on why I signed up to be part of this event, I signed up on the back of visiting a very exhausted but clearly high as a kite on endorphins Mark Halstead, after Mark gingerly brought me a coffee from his kitchen to the front room, still clearly in some discomfort. The sadist in me thought I’ve got to get involved in this, this looks too good to miss. Friday: After an uneventful drive to Belvior Castle (Please note that the local’s pronounce it Beaver anything else sounds posh and really grinds their gears!) We set up camp, once they let us in. (unlike Lady P (Polly) and her entourage, they somehow gained access with by security assuming they were part of the organising event team, because they were so early! We all helped each other set up camp at what I’m reliably told is “the best spot” to see your team mates coming in around the 8k marker over the lake opposite. This was great till I remembered our team colours were a pink that vibrant you could probably spot from the castle that our campsite could see a mile or so away, and also for some daft reason I signed up with the rest of the ment in our team to get pink nail varnished up by our resident one legged “stump” smurf Amy. So this best spot idea probably was irrelevant. 9pm at Equinox is a traditional event known as the beer run, a 1 mile loop around the campsite after necking a beverage from the bar! I lined up for this with Dave Leonard, Luke Cutler & Darren Poulton. Darren we had noticed had put on his running gear, and looked serious about winning the race, he informed us “I’ve got this” as he came 2nd the year before. I didn’t fancy my chance’s considering I'd drank quite a bit leading upto the race, plus I'd had a healthy portion of Polly’s stew. This race started after a few shots of the camera team taking some pictures of us post beer, then a 321 go got us on our way, now considering I was 2nd last leaving the line, I managed to pass quite a few green wrecks going round the course. I’m not sure what position Darren finished, but he may have got pipped on the line by Dave who was in jean shorts and not his best running trainers. I do remember Luke & Darren both not feeling great after this short race. Fun though, and no ill effects on my part, I don’t know how I manged this and also think a few amongst the camp that were wondering the same! More beer & some pizza happened after this, and some noise! 7am, I was awoken to the smells of bacon! I went off for a pre-run stroll and sampled some of the wonderful breakfasts on offer for my pre-race car load! On returning to the camp I was reminded that when drunk or really tired, I snore! My neighbouring tent and resident one legged Smurf reminded me of this, I think I’ve been banished to the Mark Halstead side of the camp next year. 12pm the mass start, the 10k race, solo runners, the pairs, the small teams, the large teams all get started at the same time. Some crazy loon started in a massive bumble bee outfit! The havoc’s team first runner was Carl Evans; I was left strict instructions not to forget his shower bag as I was running second. (Dave was still in the dog house from forgetting this last year!) Carls first lap was sub 1 hour. I didn’t forget his bag. After a quick hand over I set about my first ever lap of the Equinox course, not knowing what to expect other than 2 hills, one called That Hill & Not That Hill! Let it be known I normally enjoy hills, But not that hill is worse than that Hill just because it goes on for ages! I also managed a sub 1 hour and my stand out memory of this lap was trying to pace a solo runner called Dwayne, this was because his wife had told him off for going far too fast on his first lap! I did manage to get a memorable picture taken of me at the top of that hill; the photographer had the cheek to tell me I'd almost ran all the way to the top! I finished my lap & handed over to the Speedy Dave Leonard. Dave put in good shift, I think around a 46 minute effort, this put a nice 20 minute plus cushion for the team to average an hour. Up next was the 2nd half of the 1st husband and wife combo, Helen. Helen finished her lap in a very respectable 1 hour 19 mins, I don’t remember Helen setting a target, but in think it may have been an hour & a half. Helen handed over to team Captain Sarah Green did her first lap in sub 57 minutes, but was worried her race picture might have thought she was signalling for first aid! Sarah was sporting a wonder woman top and crossed her arms for effect to a photographer; if she weren’t smiling so widely they might have rushed in some paramedics. Sarah handed over to the 1st half of the Eccles Husband and wife duo. Polly clocked a first lap that was just over an hour, and then Polly handed over to Hamish the so called “Non-Runner” who said he’d be around an hour twenty. Hamish came in around an hour twelve; Hamish made us all laugh though with his star jumps over the other side of the lake, Hamish handed over to Cheryl Wiles. Lee Rudd had to run to the hand over point, twice! Lee did struggle to sleep though; Lee was kept awake by the lights moving over the lake. Our cheer leading squad were great; we had a line of kids handing out jelly babies to weary runners. They were grateful, even if they sometimes tipped them on the ground first. Darren’s boy caused much laughter though by licking the sweets first before handing them out, he then constructed a neat live of Haribo hearts, and for his final distracting action he decided to throw off his nappy & hand out sweets with his bottom on show! Alfie and the horn & Mark Halstead, such fun, but then I had to hide the horn! Jageur Bombs for soloists, we made a sign attached to a brolly inviting then in for a Jaguer bomb, out of the whole field we only got one taker, just before my third lap! This lady trundled back a got 2 yards for a swift drink before setting off again. I was very nervous about doing this event; I'd trained a lot over the past few weeks at 10k distance, but this year I'd not done much in the way of anything more. This for me was a test of mental strength as well as physical ability, trying to get my mind round these night laps & how fast I'd think other team members will complete their laps, will I have to do another one, would my body take another lap. I really enjoyed this experience, even if my manhood was destroyed by pinking up! I’m definitely looking to do next year’s event, get involved! Enjoying my birthday at the Grosvenor Chester, the next day John and I popped up to Whitworth next to Rochdale to do a 5k hill run to celebrate Ron Hill's birthday theday before mine as he is one of my heroes. After battling the traffic on the M60,62, etc we made it in good time, then it started to rain. We started at the bottom of a hill getting darker quite quickly. I had my torch with me and Linda who very kindly offered to run with me. Of we went up the steep hill, by the time I got over the hill and started to down to the reservoir we met the very fast ones coming home. At least we were on the right track. We needed to go round twice, we were told we only needed to go round once but Linda and me said we're doing it properly! By now it was really raining and quite dark so our head torches came in handy as this is quite tough route, I was hoping to get back in by the hour and yes thanks to Linda! Straight in to the pub then, I had a lovely surprise I won 0/70 this was surprise to me as I thought there was other ladies in the 0/70. I had a large mug of very good tea, had some food and after a lot of chatting we set of back to Shropshire. The weather was very bad and with all the alteration on the different motorways I looked for Birmingham and kept going till we got to Stoke. Once back home I tried my champagne out. I loved it and plan to do it next year! This is an undulating course of steady and long inclines and declines. It's multi-terrain which I enjoyed, starting and finishing in the arboretum on paths and grass leading to road then tracks through fields and woodlands then back onto road, which kept it interesting. The downside for me was firstly the basic medal. There was no other race momento either. Secondly, there weren't enough marshals at some points on the road part of the course. It was unclear whether you could run on the road or on the grass verge, roads had not been closed and marshals didn't give instructions so runners made their own decision where to run. Thirdly, there weren't many marshals on course cheering on runners, a lot just stood like statues. I did like the course but I wouldn't rush to enter again next year. This was a low key race just raising funds for the school. Well, for the first five Km it was hill after *bleep* hill. It was sheer hard work but stuck at it as no way was I giving in. When I finely got to the top I thought "I'll be ok!" then realised "More hills!" but not too bad. The scenery was awesome once I got to km8 and it seemed a bit easier only to find it very steep going down. My knees seemed ok but after a while could feel the tension. At km 10 things got a bit easer knowing I was on the last bit. At the finish the sun was shinning and the finish of the race was at the top of a hill. Lots of people from the village waited for me and cheered me in some of them said your never do it! (I thought you don't know us Wrekin R R! ) I was invited back to the school for Tea and Cakes and to pick my prize up (wait for it!) I had won the +55 category. I had a good laugh, I thought I had won for coming in last.. It was a very dull and drizzly morning as we arrived at Abbotts Bromley in Rugeley at Blithfield Reservoir sailing club. The first shock was when we got out of car the grass had not been cut and me with my little legs, got wet from the long grass. I went to collect my number and the man behind the table looked at me strangely and asked me will if I be alright "It's a long way round the reservoir!" I just looked at him and said I'll give it a GO ! It started on time and was a lovely run once we go to the other side of the reservoir. It became very hot with sun coming out. It had some nice little hills and good marshalling. I really enjoyed it and would do it again, it was completely different from last week's race. This is the second time I have ran the Bank's 10k, the first time in 2013. The morning starts with a wheelchair race, cycle race, half marathon and full marathon, children's race and the 10k last. There's alway a walk around West Park so something for everyone! The 10k course is slightly undulating, starting just outside West Park and running on road around residential areas. Finally you finish back in West Park. I like the course as there are spectators doted all the way around for support and a fantastic finish in the park with a large crowd. The medal was nice this year, it's my first glass medal. The Gregg's goodie bag and technical t shirt were great rewards too. I always feel nervous and a bit grumpy at the start of a race, this one I hadn't trained for and was hoping to get to 10 miles of running and then would walk if needed. Said good luck to my fellow runners and set off. Before the first mile I was over taken by Peppa Pig, I knew I had started slow but it did make me giggle at myself! Anyway I soon caught him back up at mile 2, I started to overtake people, just looking at their backs and deciding to not let them get away. A gentleman had been following me for a while and we started to chat, he was hoping to keep with me, so told him my 10 mile plan, he hadn't trained either and was just wanting to get round. I always find my mind isn't helpful until I get over halfway, started to enjoy the run then. Found a second wind at 10 miles and lost my running friend. lots of people with sweets along the way but I didn't eat any, and there were 4 water stations giving bottles of water (much better than cups). The last miles curves round the park so you can hear the finish line and music etc but it felt like it went on for ages, but then you turn in and see the finish and a rush of happiness and I had a bit in my legs for a decent finish. If you have never done these distances before I would say it is a good one as a first.